The NBA Closer is written by Matt McHale, who kind of thinks that Sasha Vujacic looks like Steve Nash's evil, retarded clone. When he's not wondering whether scientists should do a DNA check on those guys, he can be found building the world's largest ball of belly button lint at Basketbawful. Enjoy! 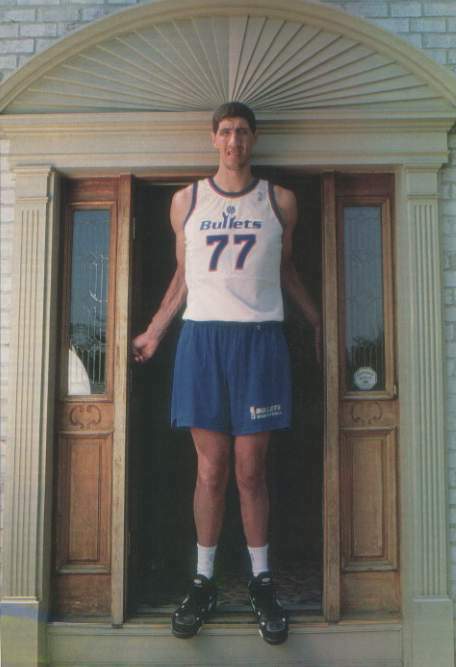 Mamba scored 36 and grabbed 7 rebounds, and the Machine fabricated 20 points on 7-for-10 shooting, which included a trio of three-pointers that couldn't have been any bigger if you duct-taped Gheorghe Muresan to them. Now, you'd think that Boston's Ménage à Trois could have overcome L.A.'s Titanic Twosome — or should I say Wonderful One-and-a-half? — but that would have required all three of those guys to actually show up. Ray Allen scored 25 (8-for-13, 5-for-7 from distance), but Kevin Garnett spent most of the game jackin' it up from a little too far outside (hence the 6-for-21 shooting) and Paul Pierce was...well, let's just hope his knee was really hurting him. At least that would explain the 6 points on 2-for-14 from the field. Still, despite all that — and despite the fact that Rajon Rondo sprained his ankle and had to limp back to the locker room for a while — the Celtics kept it close and actually had a five-point lead in the fourth quarter. But anybody who didn't think the Lakers would come storming back probably doesn't think Sylvester Stallone's face has been pumped full of Botox, either. L.A. had cut the lead to two when Boston somehow inexplicably left Kobe alone at the top of the arc long enough for him to measure a three, mentally go over the grocery list, and solve the Riddle of the Sphinx before ripping a three-pointer that gave the Lakers the lead back. And that was the gamebreaker. Seriously, I think the Celtics lost four points after Kobe hit that shot. It sure felt like it, anyway. But despite Kobe's 36 points, the huge three, and his 18 free throw attempts, Doc Rivers knew what really beat his team. 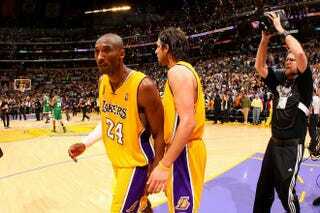 "Kobe was fantastic but I thought Sasha Vujacic was the key to the game. I said before we are going to have to win a game when Kobe Bryant plays well. We know that. But when that happens, we have to shut off the other avenues." That didn't happen in Game 3. We'll see if it happens in Game 4. Which is Thursday in Los Angeles, by the way.